The Ryoan-ji Temple was once the country estate of the Tokudaiji Clan. In 1450 it was bought by Hosokawa Katsumoto who converted it into a Zen training temple. Neither the origin nor the meaning of the rock garden is definitively known though according to the brochure, Tokuho Zenketsu, a Zen monk, may have created it around 1500. 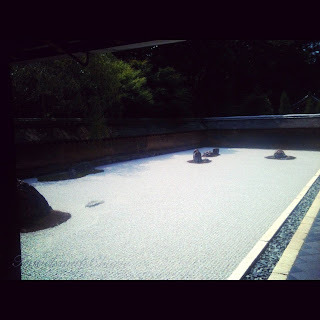 The rectangular garden has 15 rocks (both large and small) sitting on moss and look like islets amidst white gravel. It can be viewed from the portico of the Hojo which was the former residence of the head priest. There are stairs leading down to the stone garden where you can sit awhile and meditate on the significance of this creation. But at midday the intimate portico becomes too crowded and meditating or taking an unobstructed photo may present a challenge.